York Street, looking north, 1856. City of Toronto Archives, Fonds 1498, Item 16. 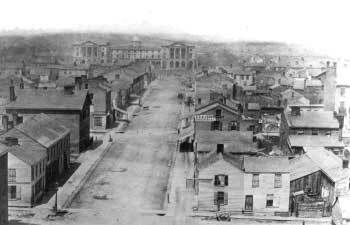 York Street, looking north, 1856.Osgoode Hall may have been outside the limits of York when its construction began in 1829, but the city lay just across the street. Most of the land south of Lot (now Queen) Street was already occupied. In the 1830s, with the population doubling every five years and the potential for substantial profit, the owners of the 100-acre lots along Lot Street started to subdivide their properties. Around Osgoode Hall the parcels had a small frontage on Lot Street and were meant for working class houses. 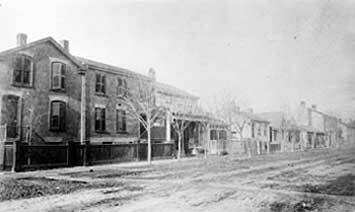 By 1850, Toronto’s main streets were Front, King, Richmond, Adelaide, Queen, Yonge, Church, Bay and York. By 1885 King Street between Church and York remained the commercial centre of the city but Queen Street was gaining in importance. West side of Centre Street looking north from Osgoode Street, c. 1890. Toronto Public Library (TRL), T 12491. Macaulaytown, the area bordered by Queen, Yonge, Edward and Chestnut Streets, was born at the same time as Osgoode Hall. The area later known as the infamous “Ward” provided a decent home to a variety of tradespeople. The district consisted of one and two-storey wood-frame houses and cottages finished in stucco. The community contained a few public institutions, churches, small factories and workshops. Until the turn of the century its inhabitants were mostly of Anglo-Saxon extraction. Although the area was not identified as a problem district until the late 19th century, a poor house was set up at Elm and Chestnut in 1848 and at least one house on Sayer (Chestnut) Street was a known brothel. 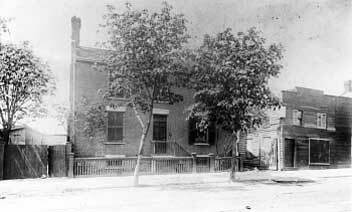 House of William Lyon Mackenzie, York Street, c. 1885. Toronto Public Library (TRL), T 11408. The well-to-do of Toronto resided along Front Street and on the park lots. As the parcelling off of the latter proceeded, the area became socially mixed. By the 1850s the neighbourhood was becoming distinctly working class. William Lyon Mackenzie rented this house in 1835. This was his residence when he lead the 1837 Rebellion. His family was under surveillance in this house until they were allowed to join him in the United States to where he had fled. The house had underground cellars, a cellar-kitchen and good drains. There were five bedrooms on the second floor, a garden with fruit trees and a stable for two horses. Its well was said to have one of the purest waters in Toronto. The house was demolished in the 1890s. 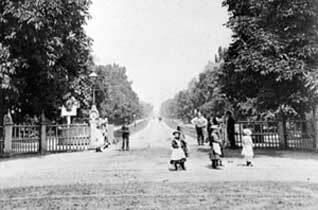 College (University) Avenue gates, looking north from Queen Street West, 1880 (?). Toronto Public Library (TRL), T 13828. University Avenue started it existence in 1829 as College Avenue, a private road leading to King’s College. The college, the ancestor of the University of Toronto, stood at the location of Queen’s Park. The road was closed to commercial traffic and no streets were allowed to intersect it. Access was controlled by gatekeepers at both ends of the Avenue. The City, impeded in its advance by this private enclave, took a 999 year lease on the Avenue in 1859 and opened it to general traffic. Running parallel to College Avenue was Park Lane, later called University Street, which was eventually absorbed by University Avenue. College Avenue was carefully designed and landscaped. Its chestnuts trees were renowned and the road quickly became a favourite destination for Sunday strolls. 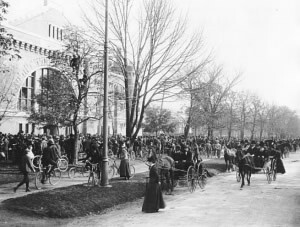 The Armouries, University Avenue, c. 1900. City of Toronto Archives, Fonds 1497, Item 3. The Armouries were built in 1893 to house Toronto’s militia regiments. It was the largest building of its type in Canada and even, for some time, in North America. The Armouries were demolished in 1963 to make room for the courthouse at 361 University Avenue. Beside its use for military training, the building was used for trade shows and social events. During World War Two, the Law Society’s Canadian Officer Training Corps used the Armouries’ facilities for training. Neighbouring Osgoode Hall was also used by the military for classroom education. The proximity of the Armouries could be a problem: in 1903 the judges and benchers at Osgoode Hall complained that gun salutes rattled the building and made them fear injury. 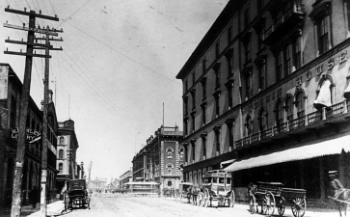 York Street looking north from south of King Street, 1890. Toronto Public Library (TRL), T 12910. In the foreground is Rossin House, one of the most fashionable hotels of the day. Opened in 1857, it was dethroned by the King Edward Hotel in 1903 and was finally brought down by the arrival of the Royal York Hotel in 1929. The building was demolished in 1969. 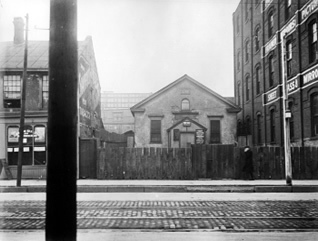 African Methodist Episcopal Church, Richmond Street, 1913. Toronto Public Library (TRL), T 33461. Blacks were one of the earliest minority groups to settle in Toronto. The first Blacks came to Toronto around 1793 as slaves or servants of British officials. The next wave of immigration came from the United States and consisted of slaves escaping captivity or freemen hoping to find work in the rapidly growing city. In 1837 there were at least 50 Black families in Toronto. Blacks were generally more prosperous than the groups that came later. Many had trades and a number of them became successful business people and property owners. A significant portion of the early Black population settled around Osgoode Hall. Several churches were established in the neighbourhood. The African Methodist Episcopal Church was formed in 1833.